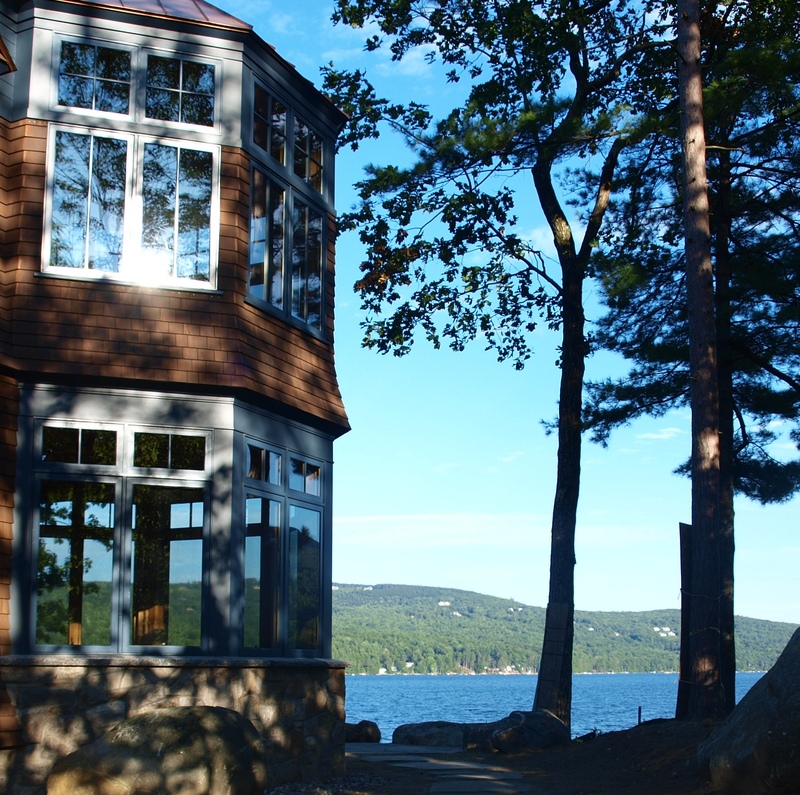 This Adirondack style home is located on Lake Sunapee. The timber frame for this home has unique and subtle details. Ready? Let’s take a look inside. What caught my eye first are the center posts, because they frame in the kitchen space. On the post closest, you can see how the chamfer doesn’t start until a good distance above the countertop, which is an interesting design detail. The same chamfer stops a similar distance below the ceiling at the top of the post. 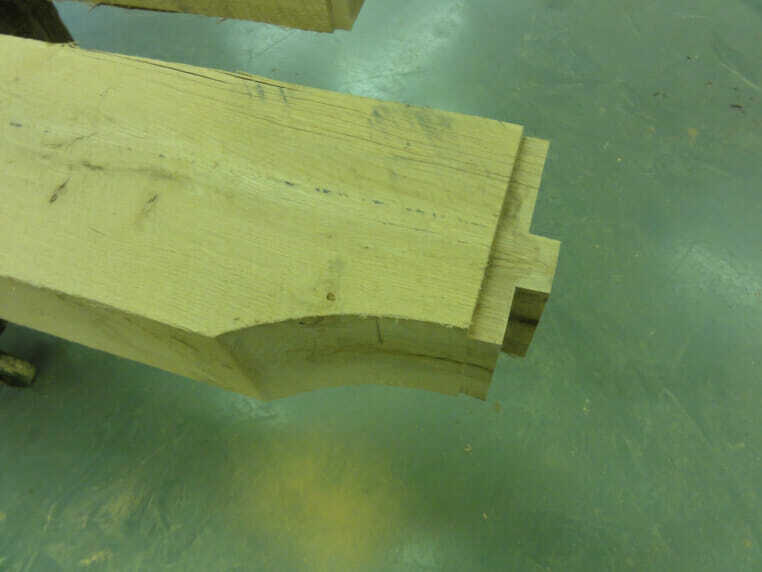 Another interesting detail are the joinery pegs, which are extended (love that). 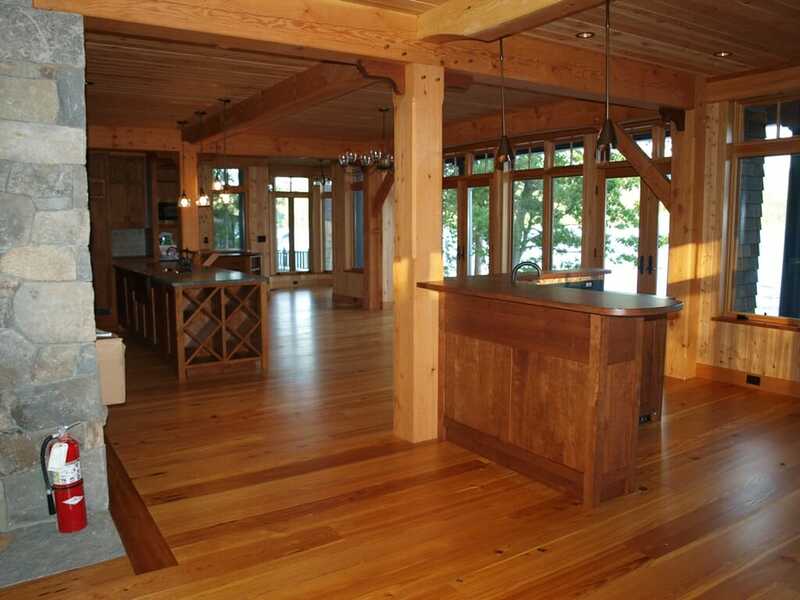 Also, this home has cherry corbels, which accent the douglas fir posts and beams. A final unique detail are the ceiling beams that connect with the support beams. They have a curved cut. Mike is working on a similar cut in the picture shown below. He is cutting with a hand held band saw. We also have a stand alone band saw in the shop for bigger cuts. 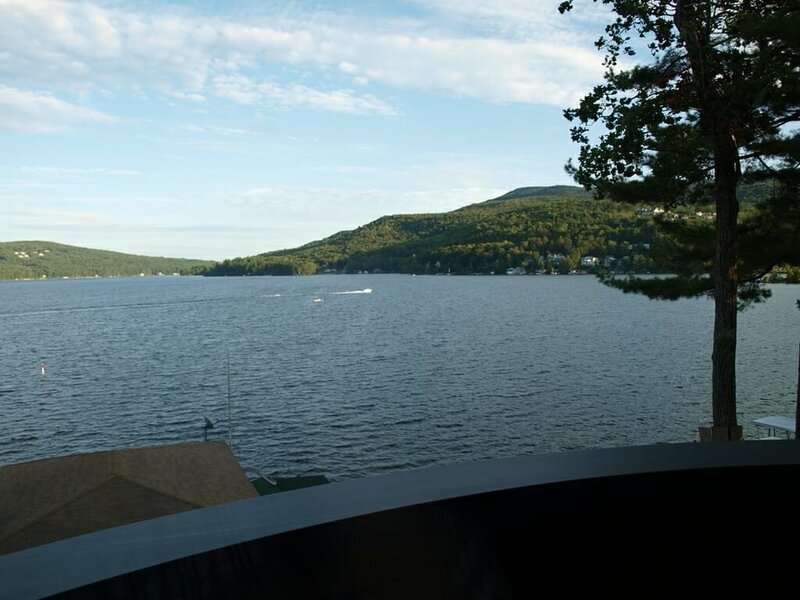 Back outside we go, this house has such a pretty spot on the lake! 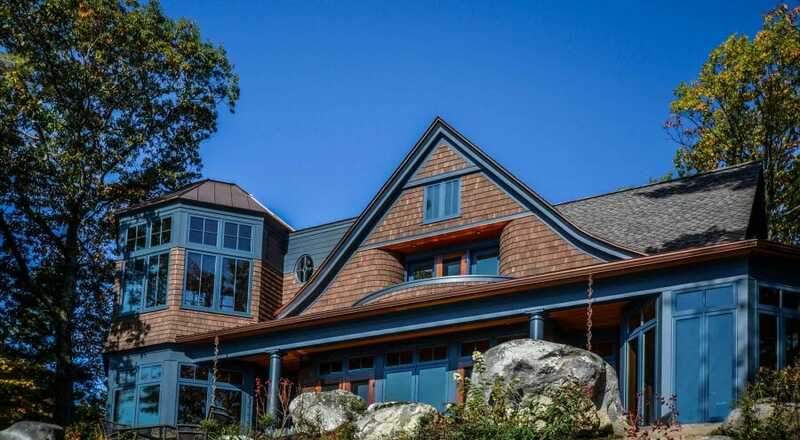 Bonin Architects + McGray & Nichols + Vermont Timber Works all worked together on this adirondack style home. It was a great collaboration! If you like this project or have any questions, we encourage you to get in contact or share your thoughts in the comment section below! I’m recognizing those cabinets! Wonderful project! State of the art designs. Truly an art in the hands of professionals. Thank you Rodney, we appreciate your comment. 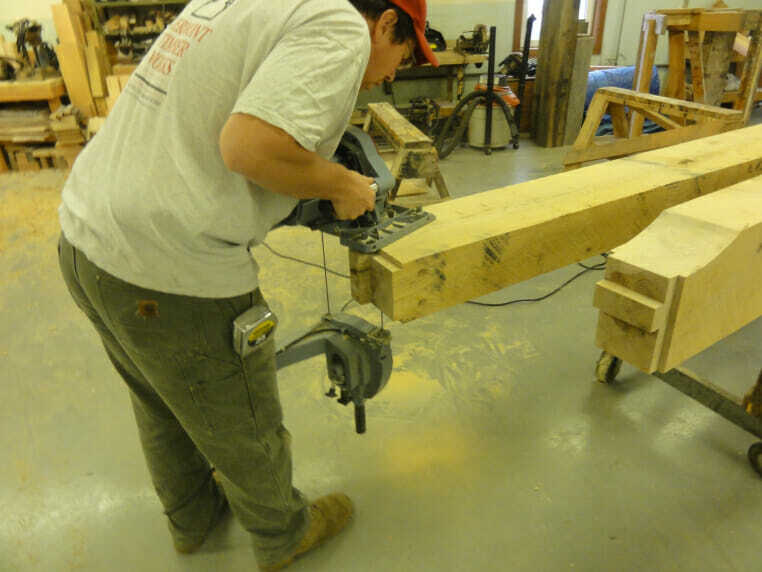 Happy Timber Framing!